SQLyog has an ability to format the SQL displayed in the active QUERY tab. You may format a single query only or the complete content of a QUERY tab. Formatting will help you to understand the structure of a complex query. If you have been working on a query (editing and copying) it will not always be well-formed. That you can corrrect with a single click. This is also useful if you want to save a query (as file or 'favorite') or if you want to use the query in an application. -- Format Current Query: To format a particular query in a batch, just place the cursor on the query to be formatted (i.e. before the semicolon separating the query from the next query). Select Edit -> SQL Formatter -> Format Current Query (or press F12). Only the current query would be formatted. -- Format Selected Query: To format a selected query(s) in set of query(s), select the query(s) to be formatted. Select Edit -> SQL Formatter -> Format Selected Query (or press Ctrl+F12). 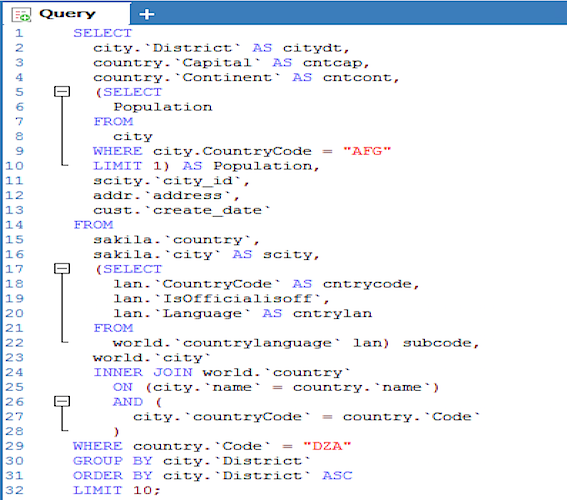 -- Format All Queries: To format the whole batch of queries entered in the SQL window. Select Format -> SQL Formatter -> Format All Queries (or press Shift+F12).